The Bissell Company is one of the oldest and most well-known manufacturers of high-quality vacuum cleaners on the market. They certainly don’t disappoint with this 18P03 model, which is a wall-mounted vacuum from their Pro series that’s suitable for both wet and dry situations. This vacuum is designed to handle the messes made in garages, basements and workshops and it’s so effective that it leaves spaces completely free of any kind of debris. This includes your garage surfaces, floors and workbench tops. It’s even perfect for use in cleaning your car because it comes with multiple attachments that enable you to clean hard-to-reach spaces and upholstery. Some of the notable features on the Bissell Garage Pro 18P03 include the reverse airflow function, which makes it possible for this unit to double as a blower. If you’re interested in this fantastic vacuum, read on for more information so that you know what to expect from it. Size is one of the most important considerations to make when you’re purchasing a vacuum cleaner and the same goes for a car and garage vacuum. The Bissell Garage Pro 18P03 fares well in this department with a 4-gallon tank and a thoughtful design that makes it easy to use all of its included features. Plus, the container features a semi-translucent design that allows you to see how much space is left before you need to empty out the receptacle. The 18P03 is easy to assemble and mount because it’s prefabricated which means there’s no need for additional tools. It’s also easy to empty the tank, as all you have to do is lift the side handles and unlatch the upper half of the unit so you can dump out the dirt. Just be sure to take out all the accessories and components on the bottom tank before you start using the vac. You can easily put them back in when you need to, using the same latch handles to make sure that everything is secure. This is a wall-mounted unit that stays out of place and is ready to use whenever you need it. Unlike vacs that are placed on the floor or in cabinets, this one takes up very little space and leaves enough to store other things that you need in your garage. Plus, you’ll be able to work comfortably knowing that there’s no chance of this vacuum tipping over. The Bissell Garage Pro 18P03 comes with a variety of different accessories that make for customized cleaning. This includes a mounting bracket with no screws, an accessory caddy to keep everything organized, a hose holder with fasteners and a 32-inch flexible hose that also happens to be crush proof. This is in addition to the extension wands that are designed to simplify the process of cleaning rugs, carpets, and different surfaces. Then there’s the crevice tool for keeping your upholstery clean, as well as a precision suction tool for your car/s. We bet you didn’t realize that this vacuum is designed to clean cars as well, but it is! It’s the perfect vacuum to use in cleaning the hard-to-reach places in your car, especially in-between seats. You’ll also be glad to know that this vacuum will make short work of typically difficult cleaning tasks such as getting rid of sawdust or the debris that’s left behind after sanding. It’s the best solution to keep you garage spotless because you can use it to clean up messes after every project. Not only that but thanks to its versatile functionality, this vacuum can handle wet messes too, from liquid spills to small flooding incidents. Hose size is another important factor in vacuum cleaners that should not be overlooked. The Bissell Garage Pro 18P03 comes with a 32-ft. hose that stretches long enough to access difficult-to-reach spots in your garage and in your car. The length of this hose makes it possible to use the vacuum without removing it from the wall, and it has an impressive suction capability. In fact, this vacuum can pick up almost anything, from tree leaves to sawdust and small items that fit easily into its 1.5-inch diameter opening. This vacuum comes with multiple operating modes that allow for wet and dry cleaning. The unit also doubles as a blower and will come in handy when the autumn leaves start falling into your garage. Just keep in mind that you have to make sure that the hose is clear before you use this vacuum and perform a “test-blow” into a trash bag to get rid of any debris that’s left behind before you switch off the blower mode completely. The versatile functions of the Garage Pro 18P03 will save you lots of time and money that you would’ve spent buying and mounting additional tools. It’s an all-in-one cleaning solution for your garage and your car, plus you can even use it to blow out light snow as well. To ensure maximum safety, the Bissell Garage Pro 18P03 comes with a built-in thermal protector to prevent overheating. It does this by halting the main motor’s movement so that you may remove any hindrances that may cause the unit to overheat, including dirty filters, a full dirt cup or just regular clogging. The unit’s faceplate also features three LED lights that alert you about the different states of the vacuum. For instance, the green light comes on when you switch on the vacuum, the red light comes on when water levels have reached maximum capacity, while the yellow light is there to let you know when the dirt tank needs emptying. 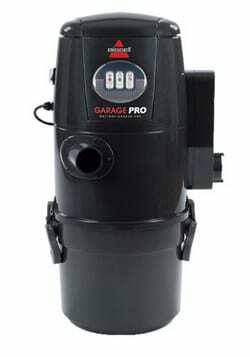 All in all the Bissell Garage Pro 18P03 is useful for anyone that’s looking for a reliable and sturdy wet/dry vacuum. You can use it to keep your car, garage, and workshop clean. The Bissell Garage Pro 18P03 is a compact, easy to use and versatile vacuum cleaner. It has a long hose to reach every nook and cranny in your garage and it’s well-made with durable materials. But, there’s no such thing as a perfect vacuum and this one comes with its fair share of limitations, such as its average suction capacity and small holding capacity. Otherwise, it’s perfect for use in the garage or in a small home, because it comes with multiple attachments including a blower and wet/dry functionality.